Looking for the perfect gift for your tots? Encourage them to explore and at the same time enhance their imagination and creativity through play pretend. Let them enjoy and shape their dream houses. 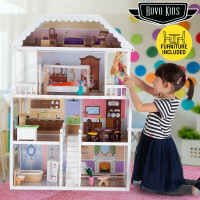 Check out the Rovo Kids Doll Houses and turn your kids rooms into miniature playscapes in an instant! 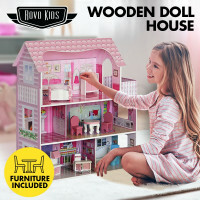 Perfectly designed and spacious enough to accommodate additional accessories, the doll houses are portable, easy to clean and assemble. These toys are made from sturdy solid wood and have non-toxic paint on them; ensuring their durability and your child's safety. Replicating the designs of modern shelters and, these play sets also come with furniture and dolls, so your kids can immediately indulge to imaginative play. Set playdates for your tots. Featuring several windows, these adorable doll houses are great to be enjoyed by your children with their playmates as they offer different points of view for each one of them. Designed with several rooms and levels, your children will surely have a fun time exploring these playsets with their friends. 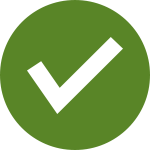 Get the best doll houses for your kids. 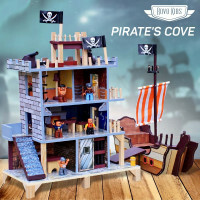 Ensured to be of high quality, Rovo Kids Playsets are reasonably priced so parents can surely get the best value for their money when they purchase these products. Put a smile on your tots' face and win their heart. In addition to these awesome doll houses, Mytopia offers a great line of toys to help with your kids' development such as elegant looking Ride On Toys, Balance Bikes and Sandpits. Always engage them in exciting, fun and imaginative outdoor play. Rovo Kids is also proud to offer top of the line Trampolines and Basketball Sets for young ones. What are you waiting for? Ready our kids rooms now. 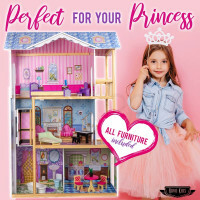 Order and purchase any of these Doll Houses and get a 12 month-warranty on us!